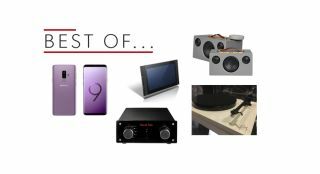 Best of the Week: Audio Pro multi-room system, Samsung S9 smartphones, Rega P1 Plus and more| What Hi-Fi? | What Hi-Fi? This week Samsung announced its S9 and S9+ flagship smartphones, Rega unveiled the P1 Plus turntable, and Onkyo a revealed a new tablet with DTS:X Premium 1.0 sound. We had the usual spread of reviews, including Audio Pro's multi-room system, Pioneer's SX-10AE budget stereo receiver and Edwards Audio's IA1 Mk2 stereo amplifier, plus plenty of advice, features and more. MORE: Win a pair of Spendor A4 speakers worth £2200! Rega has announced the P1 Plus - a Planar 1 equipped with a moving magnet phono stage. The phono stage for the P1 Plus is based on the Fono Mini A2D, but with the digital parts stripped out and the audio components upgraded. It's due out in April and will cost £328. Onkyo is making a fresh play for the tablet market with a feature-packed effort. The Granbeat is the first tablet to incorporate the new DTS:X Premium 1.0 virtual surround sound technology and there's support for DTS-HD Master Audio, too. The Granbeat also has a 12.5in 4K display and supports DTS Play-Fi streaming and hi-res audio. Pricing and availability are yet to be confirmed. After the usual rumours and leaks, Samsung unveiled its latest flagship smartphones at MWC 2018. The S9+ is slightly taller than the S9 (6.2in to 5.8in) and gets a bigger battery, more RAM, and 128GB of storage space compared to the S9's 64GB. They're on sale 16th March, with the S9 costing £739 and the S9+ £869 (SIM free). Samsung preparing for OLED TV comeback? "The key to their performance is musicality unrivalled by anything at a similar price"
Audio Pro has been steadily turning heads with its wireless speakers. Can it repeat the trick in the multi-room market? Well, we found the system easy enough to get to grips with and it's simple enough to connect your speakers, though the app is a little buggy. But it's the audio performance that counts the most and the Audio Pro system offers a detailed and expressive sound that really delivers. Pound-for-pound, this system is great value. "For someone on a budget who’s as attuned to radio as to Bluetooth streaming, Pioneer’s SX-10AE is a fine all-in-one product"
Pioneer has managed to put plenty of features into its relatively cheap stereo system, but is it actually a bargain? In a word, yes. While it's certainly no-frills, it offers a clear, energetic performance even though the sound can lack weight. Pair with some budget speakers and you'll have a decent hi-fi system on your hands. "The Edwards Audio amp fills that mid-priced gap in the market nicely"
The first iteration of Edwards Audio's IA1 didn't tickle our ears, so to speak. Can the Mk2 make more of an impression? It certainly has an entertaining sound, one that's detailed and solid even though it's not the most transparent. The Mk2 is well worth an audition.